“What if the physics of entropy was sliding between humans and objects through pure inertia?” The artist, Carlos Irijalba, uses this premiss as a springboard for his current show at Galeria MPA in Madrid. We popped in and out of a dozen small galleries on Calle Doctor Fouquet. This is our third time wandering the neighborhood behind the Reina Sofia and we were happy to see it has continued to blossom with a heavy dose of art. We loved the Wim Wenders movie on the pope. And against all odds we’re still rooting for him, Francis. With all the walking we have been doing friends keep asking if we’ve seen Wenders’ “Paris Texas.” And of course we have but it has been a long time. So it was no surprise that the movie on our train from Madrid to Leon was “Paris Texas.” Harry Dean Stanton’s dialog was dubbed and the subtitles were in Spanish so it was a different experience. Our first stop in Madrid, as we stumbled around the old city waiting for check-in, was this small church. People were gathering for mass so we only had a few minutes to look around. 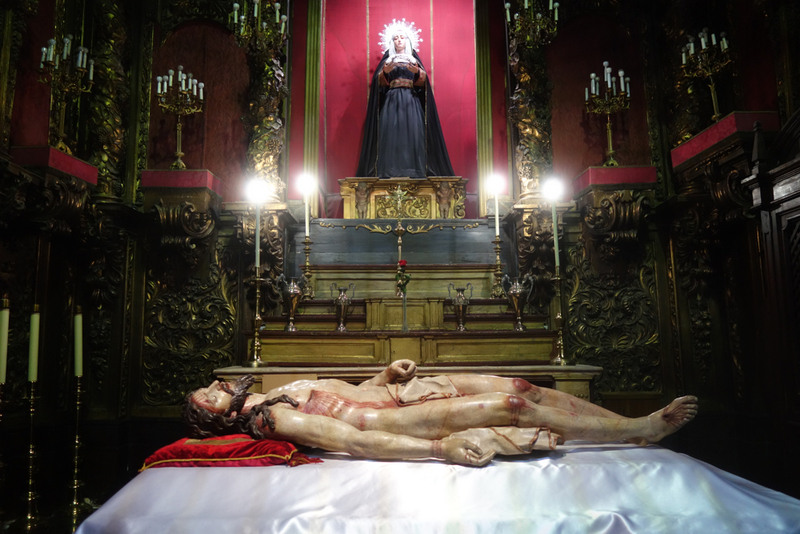 I paid my respects to this statue of Christ depicting a scene from the Passion while Peggi studied a depiction of the Virgin on the side altar next door. El Camino, part 2, is laid out before us.